elastic allows the lanyard to expand and contract to avoid tripping hazards. Also features a forged double-locking Offset snap hook at the attachment end and a #18 rebar hook at the anchorage end. •Elastic leg helps to minimize tripping hazards. •High-modulus elastic is strong and does not degrade over time. •Light-weight design reduces end-user fatigue. •The #18 rebar hook has a 2-1/4” gate opening and allows for a broader range of connections. 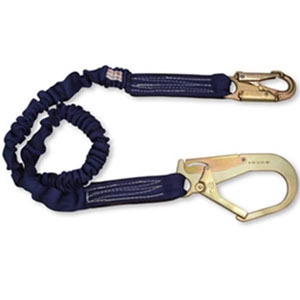 •1-5/8” Tubular webbing has a tensile strength of 8,500lbs.